Home / Licensing / Do I need to get an International or Sri Lankan license if I want to drive my own car/tuktuk/scooter in Sri Lanka, or how do I apply for an International Driving Permit while still in Canada? First things first: if you want to drive your own tuktuk, car or even a scooter around Sri Lanka, your Canadian driving license is not a valid license to go on the road with. Regardless of the type of vehicle, you will need to get an international driver’s license, also known as International Driver Permit or IDP which you can get while you’re still in Canada, and then a Sri Lankan driving license once you land in Sri Lanka. We’ve broken down exactly what you need to do to organize the needful. Make sure you have the following documents ready to go: a photocopy (both sides) of your Canadian license, two passport photos signed by you, and a completed and signed application form. For the AAA-application, you can either bring all the necessary documents to a local AAA-office, or send it via post to the address of the AAA-office nearest to you. The same rules apply; you will need 2 passport photos, a photo of the front and back of your license and a way to complete the payment. The cost for your personal International Driver Permit is $20, excluding possible postage fees. . Please note that the only institutes where you can get your international license in the States, are the AAA (American Automobile Association) and the American Automobile Touring Alliance (AATA). There are other organisations that publish IDP’s that are not legal; please keep in mind that only IDP’s issued by the AAA and AATA are valid. Now that you are the proud owner of your own IDP, your Sri Lankan driving permit is only one small step away. If you wish to organize it, visit the AAC (Automobile Association of Ceylon) when you make it to either Kandy or Colombo. A pinch of patience for the Sri Lankan system. Although this is generally a relatively and sometimes even surprisingly efficient process, this experience might be different during peak hours or peak season. Don’t worry, the office is air-conditioned! 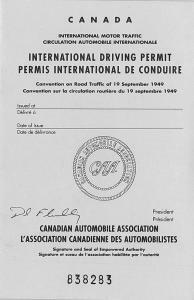 Check this website for more details on how to get your International Driving Permit in order before leaving Canada. And check this blog for more information on how to navigate the Sri Lankan licensing system. And remember, in Sri Lanka we drive on the left side of the road!